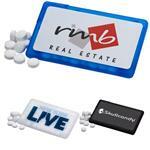 Slider mint tins with a custom imprint on the mint! Everyone loves candy and there is no denying that fact. 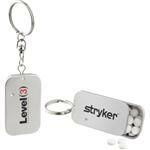 With the innovative Slider Tin, you can have a great promotional product sure to please anyone. 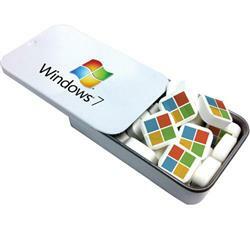 The tins can be filled with any of our signature printed candies. All you have to do is pick which one you like best. The variety of choices are peppermints, red hots, gum, candy hearts, candy stars, sugar free peppermints, colored bullet candy, chocolate littles, and even sugar free gum. You can customize your choice of candy with your logo using either a 4-color process laminated decal or a 1-color direct imprint. Cusotm mint tins are a great tradeshow giveaway. Available Colors: Gray or White Case w/ Full Color Label. 1 5/8" x 2 3/4" x 5/8"
Typical Imprint Area(s): Direct Imprint Size: 2" x 1.125"
Decal Size: 2.5" x 1.5"
Sliding Mint Tins with a direct imprint on the mint included. Price includes one design on mint, each additional design is $0.10 and an additional setup, PMS match available but CANNOT guarantee match - if match needed a production sample must be ordered in advance @ $42 - ($42 credited upon re-order from client.). Tamper evident shrink wrap-other companies use tape or stickers, Ingredients on every package, all candy options are made in America.